Pampers Baby Dry Size M.
STAY FREE SECURE,REGULAR WITH WINGS, .. WHISPER MAXI FIT 8 PADS L WINGS .. 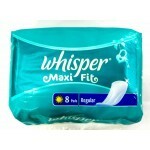 WHISPER MAXI FIT 8 PADS REGULAR .. WHISPER ULTRA CLEAN XL 7 PADS ..